The Samsung Galaxy Note 4 went on sale in South Korea last Friday, earlier we heard that Samsung had sold out of the handset in the country, although there were only apparently only 30,000 units of the handset available at launch. Now according to a recent report from the Korean media, a number of new Samsung Galaxy Note 4 owners have reported problems with their handsets. 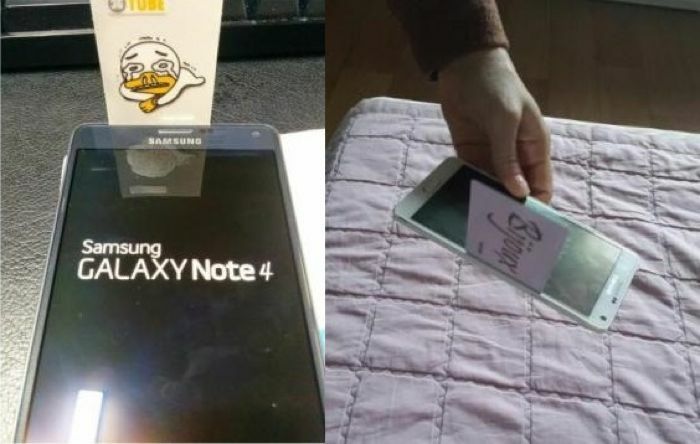 The photo above shows that there is a gap between the display on the new Samsung Galaxy Note 4 and the casing, the gap is apparently so big that a business card or two sheets of A4 paper can be inserted between the casing and the handsets display. According to various reports, this is not an isolated case and a number of users have reported the problem with the handset and a gap between the casing and the display. Samsung is apparent,y aware of the issue, although as yet there has been no official word from Samsung acknowledging that there is a problem with some Samsung Galaxy Note 4 handsets. Samsung will launch their new Galaxy Note 4 in the U.S. and Europe next month, lets hope they get these problems sorted out before the launch of the device.